What do you do on the last Monday of the year? Clean up the meowster house to PURRpare for the next year's meowvalous mess! Furstly, in between my abundacatnaps today, my smitten kitten self is taking down the Cwismus twee lights, lights and more lights and Catzowey...even more lights too! Where's the end of this thing? Tell me you have this PURRoblem too! And why is it the lights all work feline fine today and next year when I take them out of the bag, nothing lights up! That's a quizical question that might be answered by the time I use up all my 9 lives! Now where is that last sneaky string of lights hiding? Felice (say FahLEEchee) Anno Nuovo! That's eyeTAILyun for Happy Mew Year! 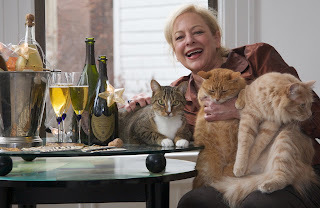 And in fine Italian feline fashion, I'm bringing out my vintage Bubbly and Nip Du Jour to toast YOU at the turn of the meowster midnight, for making my year so increducatulous! My Italian smitten kitten self hopes this 2009 will be mighty fine fur you and nonCATastrophic too. It was a widdle bit chaotic and catastrophic rounding up everyone fur the annual foto but we'd do anything for my favorite fotographer, MARK ROGERS - Hey anybody who can bamboozle 3 cats and a wiggling human in 1 foto without any hiss fits, gets my GUIDO 4 paws UP award of the year! Mark belongs on TIME magazine cover "Favorite PURRson of Da Whole Year"! But as Holly Daze bizzee as I am, I magnificatly managed to squeeze in one imPURRtant visit with celebrikitty 9 Lives dude, Morris the Cat - it's kind of like meeting Chris Cat Kringle. Not to worry cuz your site is feline fantasticat- I'm not under the chair or out of view range - Fur a change, I'm the PURRparazzi fotographer. That's momma purroudly posing with Morris. "Step it up a paw notch Morris" I hissed to him, and he and his Hollywood shades PURRformed to the max. Morris is a true gent-a-cat-man, the cat's meow and anybody with 2 or 4 paws has a widdle envy of of his income too! Now it's on Dancer and Vixen and Rudy too, honestly I don't know the others names, haven't got a clue! My Italian stocking is hung and it's catzowey full galore - gotta wait till the 25th to get it down on the floor. My atheleticat self attended a "Say See Bone" swanky San Francisco soiree benefit for Northern Calif Special Olympics last week, and definiCATically it was the Cat's Meow being at RICHART Paris the oo la la of rich yummy delictiCATible chocolates. Oh non moi - the Italian Kitty does not indulge in chocolate as we all know our 4 paws are not allowed to consume this meowvalous conchoction but my adorakitty self is amewsed with boxes of rich imported hugs, so I mugged with the most beeYOUteeful meowvalous Madame Elisabeth who is the Manager of the whole big RICHART Paris in the whole big USA. Lemme tell ya, the french hug the best and she made my whiskers wiggle so I let her beeYOUteeful self carry me around all night at the fantasticat french chocolate boutique! Fa Feline La and La De Dah! 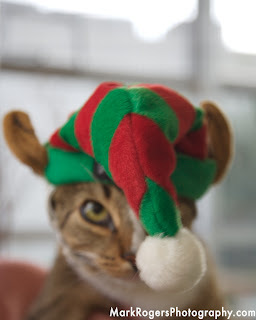 Meow and now it's time to deck the halls with balls and jolly stuff but what to choose? PURRpondering to master pawsatively great decor before my 9 lives passed, my four paws voted UP to conult Pierre de la Pen Gwin, my nonCATastrophic (and not dazed or phased) Holly Daze designer who PURRvided helpful hints on how to pick up the balls without bruising my suave Italian head- hey someone has to toss these meowster sized bowling balls on the tree limbs! Is there an Olympic sport for Holly Daze Ball Tossing?! Catzowey I think I've got it! Now if I can just find my Cwismus tree! and don't leave your Holly Daze PURRojects hanging - finish them! Just a few weeks until Santa Claws drops in and you know how sturressed people get at this time of the year, so it's imPURRative to exercise in between catnaps. You've gotta be doin' your cardiocat stuff, bench PURResses or yoga downward dog or upward pup poses to keep your meowvalous mind in balance. Balance?? Did someone say balance ... as in not falling off the edge? 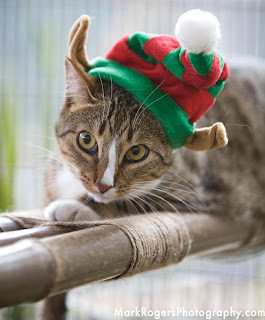 Hey fur me, balance is keeping upright on a limb while keeping this Holly Dazed hat on my head. My smitten kitten paws attest this kitty couture creation is not designed by Italia's own fashionistacat, Donnatella Fursacchi! Mirror mirror on the hollidazed wall, confidentacatically I'll find the fairest feline of all, maybe under the Cwismas tree this year! Don't get your whiskers FURazzled this holiday season, cuz it's not worth it and besides, I'm the one who has 9 lives, you don't! And be sure to get abundacatnaps so we can mouse around the Cwismas tree or jingle bell meow mix rock! Oh my golly, it's time to be jolly!! !